Small, deep pink, rose-form double flowers in November/December. A very compact plant with a low-growing, spreading habit that is perfect for container growing. Height after 10 years approximately 60cm, with a spread of 75-90cm. Prefers a sunny, sheltered position. Small, deep pink, rose-form double flowers in November/December. Very compact, low growing. Prefers a sunny, sheltered position. I ordered a 5 litre pot for my small patio area and it arrived in perfect condition with glossy healthy leaves. Big enough to have an impact and looking forward to seeing it flower in winter. Beautiful little plant arrived on time. 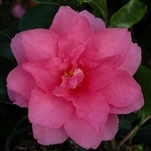 I have just received a "Dwarf Shishi" camellia from Trehane and was very satisfied with the whole process from ordering to delivery. The Trehane website was easy to work with for a foreigner like myself, and DHL did a good job delivering the parcel to my doorstep. I have shopped here before, and expect to do so again! Speedy response to my e-mail query. Couldn't have been more helpful. I was delighted to find a dwarf sasanqua Camellia and have the perfect spot in mind. The plant was really nice quality, very healthy looking and should do well once planted (snow on the ground at the moment).